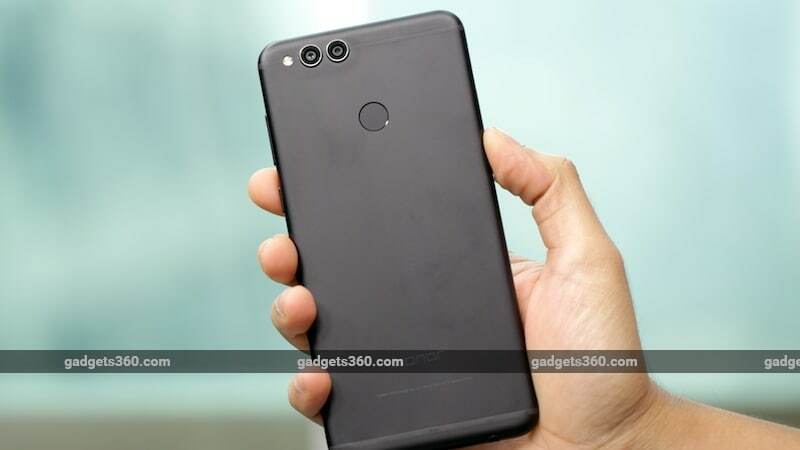 Huawei’s youth-oriented brand Honor has launched some pretty popular smartphones this year, including the Honor 6X at the beginning of the year, the Honor 8 Pro which took on the OnePlus 5, and the Honor 9i which boasted of dual camera setups at the front and back. Before the year is up, Honor will release the successor to the 6X, and it promises a fancier display, better cameras, and more power under the hood. The new Honor 7X is all set to launch in December and we’ve been able to spend some time with a pre-release unit. Before we bring you the full review, here are our initial impressions of the Honor 7X. The metal unibody looks and feels quite solid when you hold it. The matte black finish offers a decent grip too. Button placement is good and all the ports are at the bottom. Honor has kept the 3.5mm headphone socket, which is good, but it’s a bit disappointing to still not have a Type-C port. The 18:9 aspect display pretty much dominates the entire front of the smartphone. It looks great, but at 5.93 inches, it’s not easy to reach all the corners of the screen when using it with one hand. The display seems fairly sharp thanks to its full-HD+ resolution, and colours seem punchy. The back of the phone bears a resemblance to that of the Honor 8 Pro, only this time, the camera modules don’t sit flush with the rest of the body and aren’t grouped together. There are antenna bands across the top and bottom of the phone, which couldn’t be helped due to the all-metal body. Honor has also placed the fingerprint sensor at the back, and it’s within easy reach. The Honor 7X gets a new octa-core Kirin 659 SoC, 4GB of RAM, and 64GB of storage. The phone also runs on an updated version of EMUI, version 5.1, that’s now based on Android 7.0 Nougat. The Honor 6X was one of the first handsets in the sub-Rs. 15,000 segment to feature dual rear cameras, and the Honor 7X continues this trend, only his time, it ups the megapixel count on the primary sensor. You get a 16-megapixel primary sensor, clubbed with a 2-megapixel secondary sensor which is used for calculating depth. The camera app has gotten an overhaul too, which we’ll explore in detail in the full review. The Honor 7X is touted to launch in India at an “unbeatable price”. That seems to mean that it’s going to be very aggressively priced against the competition, which currently includes the Xiaomi Mi A1, Redmi Note 4, and Moto G5S Plus. In China, the 64GB version of the Honor 7X is priced at CNY 1,699 (approximately Rs. 16,850), which means that it could be priced at this level or lower when it launches here. Considering that the Honor 6X was also launched in this price range, and seeing how the 7X is only a mild upgrade over it, this seems likely. Honor has delivered on aggressive pricing in the past with the Honor 8 Pro, not only undercutting the OnePlus 5 in terms of pricing, but also offering slightly better specifications.